Over fifteen years have passed since the introduction of the Ruby on Rails technology. This server-side web app framework was created using the Ruby programming language in 2005. Today, there is a great variety of software development tools. Nevertheless, this framework, which is often called RoR or Rails, has achieved a significant popularity leap. If you want a short but credible description of the technology, a few complimentary words like flexible and agile could be used. However, they are unable to convey all of Ruby’s benefits hidden under the hood. Many famous brands and startups including Basecamp and Kickstarter have chosen the framework for their needs. Numerous development companies can be found in hundreds of cities around the globe. So, the search for RoR London or San Francisco will be as simple as typing the request in a browser. Many engineers deem it a convenient and elegant solution for their undertakings. And here is a short insight into the technology. The difference between Ruby and Ruby on Rails lies in the purpose. Ruby refers to a general-purpose programming language like C++ or PHP. It is used to create versatile software. However, building a fully functional web application with Ruby is a rather intricate task. For this reason, Rails, a web framework built on this language, should be the option. Model – relationships between objects and the database, as well as validation, association, transactions, business logic, etc. In a typical Rails project these days, the model layer is split into models (persistence, database, associations, validations) and services (encapsulates business rules and orchestrates usage of models). View – data introduction in a particular format, interaction handling and data collection from users. Controller – handing over data from views. The framework’s philosophy is exposed via the convention over configuration paradigm. You do not have to spend hours on configuration from the outset. However, any adjustments might take some time since conventions are what the Rails’ magic is based on. You are able to accelerate the web app building process and significantly reduce the number of code lines compared to using a regular Java framework. Three default environments including production, development, and testing are available at Rails. It means that the entire software development cycle is optimized. A product owner needs to estimate the strengths and weaknesses of a particular technology to decide whether it is a fit. Some solutions may be good in the short run, while others prove efficiency from the long-term standpoint. Hence, a good understanding of Ruby on Rails advantages and disadvantages is vital. Time constraints and a limited budget are regular characteristics of any startup and suitable conditions for using RoR. The framework has several aces in the hole to boost your pipeline and save money. Rails is open source. It means zero costs for the framework itself. One of the biggest Ruby advantages inherited by RoR is the ecosystem. 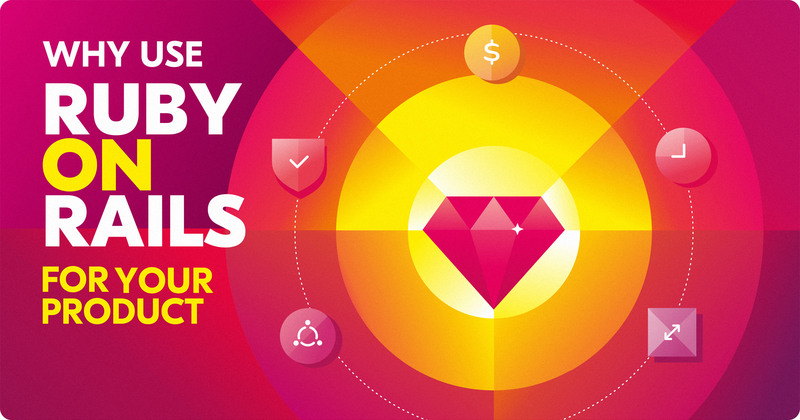 With a package management tool called RubyGems, you get access to the thousands of gems. You may treat them as libraries, software snippets, or add-ons but their gist is to provide ready-made solutions for certain tasks or problems. For example, you do not need to invent a Ruby interface for the Twitter API for your app because it’s already available for free here. In practice, it means that you can spend your time on some fundamental things and accelerate the pipeline. Ruby on Rails MVC pattern is another timesaving factor. Parallel development lets you speed up the engineer teamwork by three times. For this, you need to separate the app business logic as much as possible. And that’s one of the Ruby on Rails advantages: it provides ready-to-use baskets to implement the separation. As a result, you get a scaffold for further work. Moreover, that excludes such unfavorable outcomes as a not very readable and redundant code. Consistency is also a strong point associated with RoR. It foresees code readability and robust structure within the entire development cycle. So, any future code updates will be fast and seamless, which is another time-and-cost-saving facet. The size of a community of a particular technology shows how popular and in demand it is. Rails boasts one of the most dynamic and collaborative communities. Its members are known as Rubyists. They contribute to the RoR ecosystem by creating gems and explaining some intricacies associated with Ruby on Rails software development. Rubyists are helpful and approachable people ready to assist you with any relevant problem, as well as suggest useful documentation, plugins, modules, etc. Therefore, they are worthily considered as one of the fundamental advantages of Ruby on Rails. This term denotes the capability of an app to handle the raised load – tons of requests per minute sent by multiple visitors. In this regard, Shopify is a good example of RoR scalability. For five years, this ecommerce platform, which is one of the oldest Rails apps, has scaled to 80k requests per second. Of course, the framework itself cannot ensure great scalability without compatible architecture and deployment strategy. Still, the RoR scaling potential is advantageous. The must-read for anyone building a Rails app is this guide describing common security problems including OWASP Top Ten and how to avoid them. Moreover, among other Ruby on Rails benefits, you can select from numerous dedicated gems like brakeman, akami, and so on to protect your app from security vulnerabilities. The framework has some weak points that mostly reveal when compared to alternative technologies or depending on the gems used. Therefore, these are not actual cons but possible difficulties. Despite the vast community and tons of information available online, the lack of documentation (especially regarding particular gems) can be a real frustration. A disclaimer is needed here because the runtime speed can be both Ruby on Rails pros and cons. The app built with Rails is likely to be slower than the app built with Node.js or another technology suitable for memory-intensive tasks. Meanwhile, if compared with the Java framework like Spring, RoR will be more performant. In general, you’re unlikely to face strong bottlenecks in performance with Ruby on Rails. Read more about how the technologies compare in our blog posts: Ruby vs. Java, Python vs. Ruby vs. Node.js, and Ruby vs. PHP. Rails is written in the language created “to make programmers happy” (Yukihiro Matsumoto). It means that many programmers got converted into Rubyists for technical reasons. Some developers were attracted with the framework relevance for rapid development and building scalable apps. That’s for engineers. And what about companies that use Ruby on Rails? Apart from the already mentioned Shopify, there is a plethora of RoR users. On August 15th, this popular web-based hosting service celebrated the end of the upgrade to Rails 5.2.1. GitHub started in 2008 and was entirely built with RoR. So far, it remains one of the big companies that use Ruby but there’s also more Go, Java, and even some Haskell being deployed for services. The tech stack of this business information platform consists of different technologies including Ruby on Rails on the backend. Crunchbase is another early adopter of the framework. It has used it since 2007. It is known as an online community where designers and imaginative creators share their shots and illustrations of whatever they do. Dribbble was built with Rails in 2009 and has kept loyally to the framework so far. Beginner programers can encounter numerous guides on how to build a Dribbble clone with RoR. These are only a few examples of what Rails was used for. At the same time, the framework has vast capabilities for web app development. What can you build with Ruby on Rails? Entrepreneurs engaged in financial technologies projects should be unaware of RoR applicability in this regard. The framework allows you to cope with the main development challenges of a fintech app and deliver a successful product. Examples include Squareup, a payment service, Fundera, business-to-business lending service, and many others. Here you can learn more about RoR for fintech products. The benefits of Ruby on Rails make it a perfect option for software as a service. Zendesk is a good example of successful SaaS built with the framework. This cloud-based customer support platform is trusted by over 200K customers all over the world. Perhaps, this use case will convince you to choose Rails for your next SaaS. When the context includes both RoR and electronic commerce, Shopify is the first thing coming to the mind. However, it is only one example of many others like Etsy, Brandless, Instacart, and so on. Rails offers a wide ecommerce-oriented ecosystem consisting of dedicated gems, fully-functional ecommerce frameworks, and customer management systems. Did you know that Twitter was initially built with Ruby on Rails? Some years later, this communication app pivoted from a traditional web framework to the distributed message broadcasting system (mostly written in Java). Other examples of RoR applicability for building a communication-oriented platform are Basecamp and Dribbble. Here is another type of app you can build with Rails. Slideshare is known as a large content sharing community, where users can share versatile sorts of presentations and infographics. It was created using RoR just like Hulu, a video streaming platform. What you should learn is that Rails is the framework, which lets you build almost any web app. Here you can find more use cases in this regard. a quick prototype is needed. RoR app dev is not what your team of engineers prefers. RoR means not only a stable programming environment. It contributes to the constant evolution of other technologies. Many companies that use Ruby on Rails admit its influence on other popular platforms like Java, PHP, Node.js, etc. A desire for perfection triggers competitors to improve themselves and optimize tools for app deployment, dependency management systems, template engines, package managers, preprocessors, and others. The teach-and-learn capabilities are also enormous and here is the best place to learn Ruby on Rails. The Railsware team decided on the framework long ago. Besides, as you can see, technology has contributed to not only the basic principles of our company but even its name. And this choice was based not on the RoR popularity but rather on its ability to implement ideas in a fast and cost-effective way. That’s what makes both clients and developers feel happy.